Mirjam Ott, a two-time Olympic silver medallist, skipped her Swiss team from Davos to her nation’s third world women’s curling championship and the first since 1983 Sunday night, upending Sweden 7-6 at Lethbridge’s Enmax Centre. 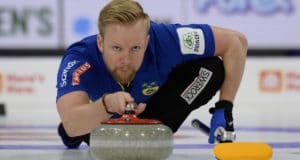 The win in the Ford Worlds final avenged a Friday night loss to Sweden in the event’s Page One-Two playoff and left skip Margaretha Sigfridsson with the dubious record of having lost two World finals, one Euro final and won World junior final. Ott, directing third Carmen Schaefer, second Carmen Kueng and lead Janine Greiner, won the title in her sixth World appearance and defeated Korea on Saturday night to reach the final. The last team from Switzerland to win a world women’s title was skipped by Erika Mueller in 1983. Gaby Casanova skipped the first Swiss winner in 1979, the year the championship was conceived. The Ott team finished the nine-day championship with a 10-4 record. Sigfridsson, who threw lead rocks and skipped fourth Maria Prytz, third Christian Bertrup and second Maria Wennerstrom of Sundsvall and Harnosand, finished at 9-4. Sweden was bidding for its ninth world title. Earlier Sunday, Canada won the bronze medal with a 9-6 victory over Korea. Both finished with 9-5 records. 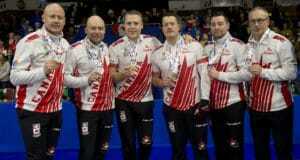 Previous: An Alberta Sweep At The Canadian Seniors! Cathy King in History Books!